With the number of Medtech conferences growing each year, it’s getting harder and harder to choose where to go and where to spend your time and money. Don’t worry, as a company much connected to the Medtech world, we decided to do the hard work for you! 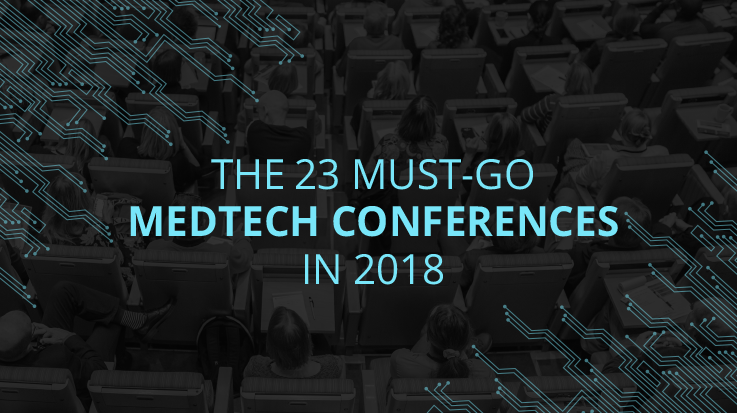 Yes, we’ve compiled the 23 top conferences you should attend in 2018! Description: The HIMSS Annual Conference & Exhibition brings together 40,000+ health IT professionals, clinicians, executives and vendors from around the world. Exceptional education, world-class speakers, cutting-edge health IT products and powerful networking are hallmarks of this industry-leading conference. Description: Join us for a discussion on how the medtech investing landscape is evolving. Expert panelists will share insight on who is investing, what they are investing in and how it will change medtech in the future. Description: When it comes to medical ultrasound, there is only 1 event every year that brings together experts from more than 20 medical ultrasound specialties searching for new and innovative solutions to improve patient care: The American Institute of Ultrasound in Medicine (AIUM) Convention provides a unique opportunity to engage with a cross-section of medical experts across numerous specialties, all focused on medical ultrasound. Description: The Design of Medical Devices Conference provides a national forum to bring together top medical device innovators. In its fifteenth year, this MedTech conference includes industry experts as keynote and featured speakers, plus four days of workshops, symposiums, scientific poster sessions, and technical/scientific sessions covering such topics as advances in medical devices, becoming a MedTech innovator, cardiovascular engineering, micro fluidic medical devices, wearable medical devices, and more. Description: Medtec Europe is the preeminent medical technology platform showcasing the key trends and insights across the entire supply chain of the medical technology industry. How much? 49,50 – 99,50 EUR. Description: The largest medtech event in New England, Biomedevice Boston connects attendees with over 4,000 engineers and executives — as well as more than 400 leading suppliers — across New England’s thriving design and manufacturing industry. Hear from top keynote speakers and explore the Sensors Zone, a dedicated area of the expo floor showcasing how sensors are disrupting multiple facets of your industry. Description? Every MTI event brings together some of the most pro-active and ambitious investors with the most ground-breaking early- to mid-stage life science companies from around the world looking for their next round of investment. Description: Industry leaders will provide in-depth and timely updates on The state of medical device cybersecurity, Issues related to FDA requirements, Cybersecurity management practices and more. Description: This is the only manufacturing exhibition in the UK featuring more than 130 companies covering packaging, medical electronics, medical plastics, design, sterilisation, components, manufacturing equipment & services. The event also includes conferences addressing key trends and challenges facing the industry and specialist seminars covering critical design, innovation and manufacturing. Start expanding your network and landing more business leads! Description? The world’s premier patient-centered conference on emerging technology and medicine, Stanford Medicine X attracts the most innovative minds in academia and industry to exchange new ideas about the future of medicine and the role technology will play in improving healthcare. Description: The Hospital and Healthcare IT Conference is designed for both healthcare providers and suppliers, is focused on networking and educational sessions, as well as a reverse expo for talking with solution providers and learning about new health IT options. Description: This year we will explore and aim to fuel the innovations and trends that are shaping the future of healthcare systems and life sciences. Description? showcase and explore the latest innovations in health care in areas including: patient-provider communication, consumer health, genomics, data analytics, corporate wellness and so much more. Description? The Medtech Conference is an Unparalleled Gathering of the Leading Innovators, Investors and Executives from around the Nation Discussing the Timeliest Issues and Opportunities. Description: With 600 international participants from 20+ countries, MedFIT is the first European business convention dedicated to innovation partnerships in the fields of medical technologies and diagnostics and also the European marketplace for investment in these sectors. How much? 259 – 944, 90 EUR. Description: AI Realized. The Xavier Artificial Intelligence Initiative presents AI Summit 2018, August 23-24. Be a part of the future of our industry by: Understanding the current use of AI in the medical device and pharma industries; Exploring cutting-edge possibilities of how the power of AI can be applied to solve your challenges in quality, regulatory, and supply chain; Engaging in AI industry-wide solution discussion sessions; Joining an AI Solution Team during the summit and beyond; Shaping the future of our industry…now. Description: The conference will meet the continuing education needs of multidisciplinary skin and wound healing practitioners, from novice to expert, by providing a forum for educational sessions and interactive workshops that offer comprehensive wound management strategies. Description: The MedTech Conference is your opportunity to connect with thousands of medical technology professionals in one place, at one time. How much? Unknown, registration will open in the spring. Description: The show brings together inspirational speakers, exhibiting companies and thousands of visitors comprised of manufacturers, designers, business leaders, early adopters, innovators and investors to an event where they can see tomorrow’s manufacturing technology today. Description: The Digital Healthcare Innovation Summit is an exclusive annual gathering of entrepreneurs, investors and corporate/strategic executives uniting to address challenges and opportunities to improve the healthcare system with disruptive digital solutions. Description: Setting the standard on how the industry should connect and exchange ideas, the Generis American Medical Device Summit provides insights and strategies to enhance the professional development of executives involved in the design, development and manufacturing of medical devices. Description: Calling all biotech entrepreneurs to showcase their company to life science investors and strategic partners during the industry’s most important annual gathering. How much? Registration will open soon. We hope you found our hard work useful, and that you’re ready to pick your events! By the way, we are 3 door digital, a digital marketing agency with a focus in MedTech and B2B strategies. We specialize in building websites that convert into leads, Increasing traffic from Google’s organic results and driving leads through paid advertising. The key is truly understanding your target customer and building the right marketing strategy to pull them into your sales funnel. If you’re interested in receiving a free consultation, get in touch! Have a great and successful 2018! Mor is a digital marketing manager at 3 Door Digital (Angora Media Group). She specializes in content and creative campaigns and marketing funnels.